In this episode, Cricket journalist and write, Chetan Narula talks about his book “Skipper – A definitve account of India’s greatest captains”, including the inspiration for the book, the research involved in writing it and also about MS Dhoni’s future as India’s captain among other things. Follow Chetan on Twitter at @ChetanNarula. 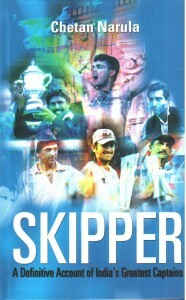 The book is available from Rupa Publications and FlipKart. They are also available on Infibeam, Crossword, Oxford, Landmark all the major book websites and stores. This entry was posted in Couch Talk and tagged Ajit Wadekar, Azharuddin, Bishan Bedi, Chetan Narula, CK Nayadu, Couch Talk, Kapil Dev, MS Dhoni, Podcast, Rahul Dravid, Sachin Tendulkar, Skipper, Sourav Ganguly, Sunil Gavaskar, Virat Kohli. Bookmark the permalink.